Officials say there was no evidence of a bird strike, and the crew followed proper procedures for troubleshooting an MCAS problem, until they turned the system back on. There's no word on how many times they turned the system off and on, although four times was mentioned. Officials are still attempting to determine why they turned it back on. Let me make a W. A. G. (Wild A.. Guess) from a pilot's perspective why they would have reset the stab trim switches (there are 2 under a guard on the console between the pilot. The erroneous AoA triggered the MCAS and it ran the stab trim to 2.6 degrees nose down. Somebody recognized the problem and turned the stab trim motors off. But then they are in a steep dive picking up a ton of speed. High speed moves the aerodynamic center of lift aft which pitches the nose down even more. They are pulling on the yoke with all their strength, but with all that speed, the elevator forces would be enormous. To reduce elevator force they need to manually trim the nose up. But they turned off the stab trim switches so the manual trim button on the yoke would not work. So to get them working they turn the switches back on. OH! (bad word!) MCAS resets, reactivates and makes things worse.That is only a guess but the CVR might confirm it. One question I have is whether this aircraft had a stab trim override switch, which on some 737s can prevent the manual trim yoke button and manual trim wheel from overriding the autopilot/software imposed inputs. One of several articles I read said basically the same, that they turned it back on to get trim control back. The AOA sensors were all over the place. Why am I thinking counterfeit or defective sensors? Since the sensors are apparently dependent on airflow, could it be possible that aerodynamic deficiencies or erratic wind conditions could cause the problem? It only affected the left side on both aircraft. So either they were sending bad data to the computer, or the computer was bad and reading it wrong. Since the sensors are apparently dependent on airflow, could it be possible that aerodynamic deficiencies or erratic wind conditions flat or nose high attitudecould cause the problem? Not really.The only attitude that cause cause such a high AoA would be a deep stall, which would be accompanied by a flat or nose high attitude. And that (deep stall) usually only occurs T-tail aircraft like the MD-80 or some Antonov aircraft. The airspeed numbers don't show any erratic wind conditions. I wonder how far the inlet vortex can reach under certain conditions: powersetting, airspeed, air density, due point, wind, etc etc etc etc. 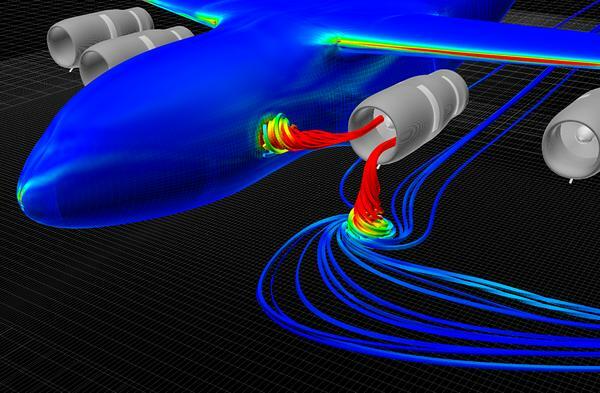 I can only find data from an aircraft simulated sitting on the tarmac with split vortexes, i wonder how powerful a single vortex that has become attached to the airplane body could become and how far forward it can reach. I've seen them on the ground lots of times (usually when it's raining or snowing), especially on the 737's and the A319's. And they definitely move all over the place due to varying conditions (wind, nearby fixed objects, terrain variations, etc.). Though, I wouldn't think at speed they would reach very far if at all. However, your idea is interesting in the context of how a sensor might get damaged, on or near the ground. ETA - Boy, wouldn't that be a son of a gun to try to mock up for testing!! !